If you’ve been following the count, you know that our final rehearsal before the NCMA performance of Finding Place is also rehearsal #9. That is VERY fast to make a 15 minute work, particularly one with this many dancers (12), but nonetheless we are upon the show! This final rehearsal was spent reviewing the entire work, making sure dancers had the details correct, and practicing what the performance will be like in this informal lobby space. The audience may walk through your pathway, and there is no “offstage” I remind the dancers; even if you are not the “performer” in a particular part, people will be watching you. You cannot relax or break character. Embody our theme, mood, and community. I utilize every minute of our 3-hour rehearsal, but as we finish at 9pm on July 5, I know when we gather again in two days for the show, we will be prepared. The dancers and I are ready and confident in the art we will present. The museum security guards are the first to welcome us with “you must be the dancers.” We carry in our wooden trough, half a dozen trash bags full of wine corks, and my great-grandmother’s trunk containing the coke bottles, make-shift caramel pie, and moon pies. The first item of business is to decide exactly where the trough should be in our space. The dancers mark through some movement so we can be sure how much space they will need, while making sure we leave enough space for the video projector and audience. A few minutes later we have the trunk and trough in place and full of corks; the dancers are free to finish getting into costume while I look for our technical assistant to set up audio and video. Naturally, being a museum, the installation of these two large items did not seem too out of place, and we had many patrons come over to get closer looks at the pair of cork containers. This provided more opportunity for me to talk about the company/the work and to gather audience for the shows; I was very pleased to see many of these same folks stick around the our first show (about an hour after set-up). For such a short amount of time in process, Finding Place premiered even better than I might have hoped. We had wonderful audiences for both shows, full of dance and art-lovers of all ages (from about 5 to 80+ yrs old by my estimates). We will surely continue work on expanding this piece, with plans to show an evening-length version in late February. (Keep watch of this blog and our website for the details!) In the meantime, I hope you will enjoy show videos clips from the performance at the NC Museum of Art. 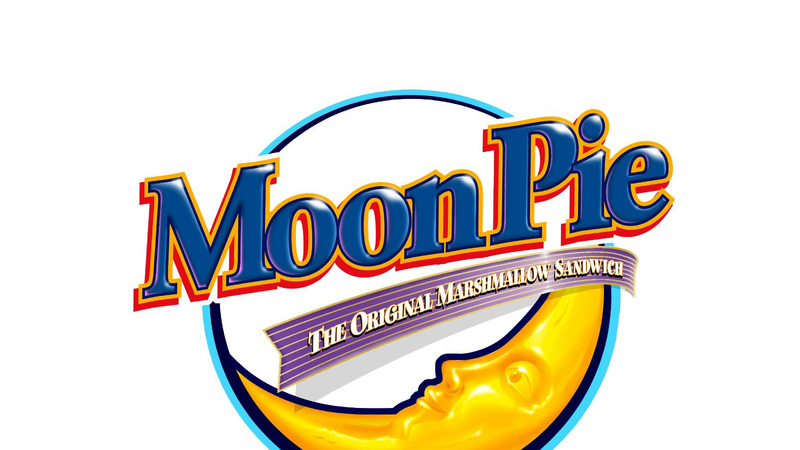 Upon hearing the story, Christina also mentions how she hates Moon Pies, so… she is the natural choice to play Jill’s sister and have to dance with a Moon Pie! The rest of the duet comes fairly easily – a combination of our playful movement from section 3 and gestures towards our coke bottles and other store provisions. The rest of the second story section is a combination of two stories contributed by our guest dancers Jennifer Kirby and Corinne Canavarro. Jennifer talks about the sentimental value of her diamond engagement ring (containing her late grandmother’s diamond), while Corinne describes her grandmother’s dining room table and its community-building properties. These two stories just seemed to compliment each other beautifully, and so I had Jennifer and Corinne each say one line at a time – alternating segments of their individual memories. The choreography followed suit with Jennifer performing short solo combinations showing the love she has for both her grandmother and her (now) husband in between the larger ensemble gathering around our symbolic dining table. There is nothing too fancy about the dancing in this section, though I have a feeling it is some of the most potent movement in the piece. Rehearsal 7: How does it end? So, true to form, the ending for Finding Place occurred to me rather early in our process, though I hadn’t had the chance to map out the exact choreography with the dancers until this (our seventh) rehearsal. 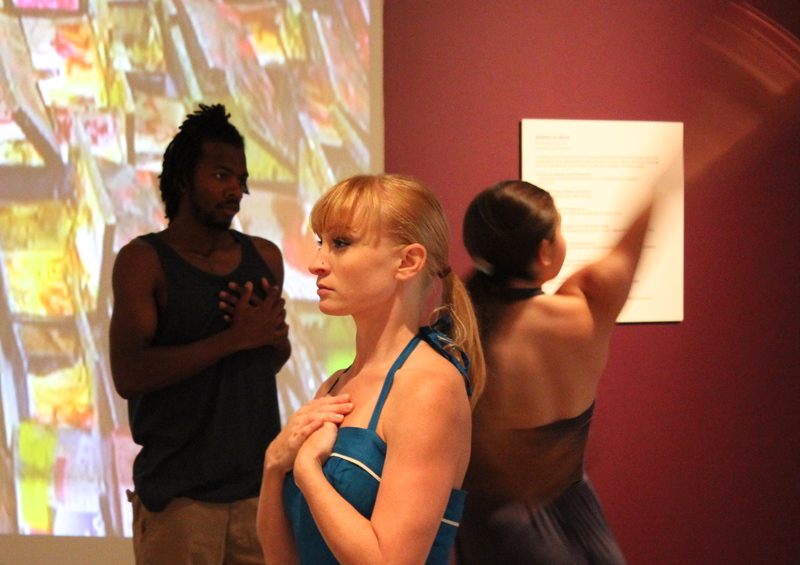 Seeing the material with our music, with all those dancers, it just looked better than I could have imagined! The projected video is also a huge part of the ending especially; we will be projecting an image of El Anatsui’s Group Photo throughout the closing of the work. The dancers become the living embodiment of this sculpture installation; they bring those ideas about community and who we associate with to life. I’m sorry that the dancers will not be able to ever see the work in its full realization, but that is the plight of the live concert dancer. You can watch videos of the work after the fact, but it is never quite as memorable as being there in the moment. I’m just so grateful there continue to be wonderful dancers to choose to perform and create those moments (even while sacrificing ever seeing them for themselves). As we come closer to the end of our process, we also began nailing down all those other details for the performance, like costumes. While I initially contemplated ocean-themed costuming (blues, teals, and greens in flowing fabrics), I had a few dancers try on some jumpsuits in the Code f.a.d. costume arsenal, and for some reason those just hit a nerve. Now to complete the idea by finding jumpsuits for a dozen dancers (perhaps minus our one man who will surely be fine in pants and a shirt)… A few of the jumpsuits and rompers found can be seen in the photo above; I can only have faith we’ll find enough that function together by the big premiere. The premiere of Finding Place will be Saturday, July 7, 2012 at the North Carolina Museum of Art. Performances will be held at 2pm and 3pm; visit codefadcompany.org for more info. Finally we get to start on the first story section of Finding Place! The story sections are where we really get to point out the meaning behind some of our movement to the audience and share personal memories about family, community, and objects that trigger those memories. This one day an older woman passed by asking for food, so I gave her some of the dried plantains I’d been eating. After she ate them, she took my hair and braided it into this beautiful, intricate pattern. Right away Kirsten’s memory set up a relationship between two women, and it gave us ample inspiration for movement – all the patterns of braiding. While the swish of a leg behind the body or the arc of an arm overhead may occur in your typical hair-braiding session, once you imagine the dancers not only as the people but also as the hair itself, I believe you will see the images quite clearly. See the rehearsal image below: Jill and Kristina dance as the braiding hair while Kelley and Euijin are braiding in a more traditional context. Danni’s caramel pie story was similar in that parts of the text translated to movement quite easily – topping the pie with Cool Whip, caramel melting and splattering on the ceiling, a dog sticking his paw right into the pie… as you can tell, this is quite a story! There are many of these humorous antics but the story also has a very touching message as Danni remembers her grandmother who originally made the recipe for this special pie. Hear more about Kirsten’s time in Jamaica and find out what happens to this disastrous pie at the Finding Place premiere! My community is made up of many smaller communities. A community should welcome you. My community likes to be active. My community is made up of artistic people and places. A community needs good energy. My community can move past disappointments. My community is intellectual, motivated, free-spirited, successful, vulnerable, and unsure. My community likes to explore the world. I have built my own community. How will these words fit into a dance? Well, that still remains to be seen, but I anticipate vocalizing and/or using projected text for some themes – others will be imbedded into movement, perhaps going unnoticed to some audience members (but still there affecting the overall mood and environment of the work). 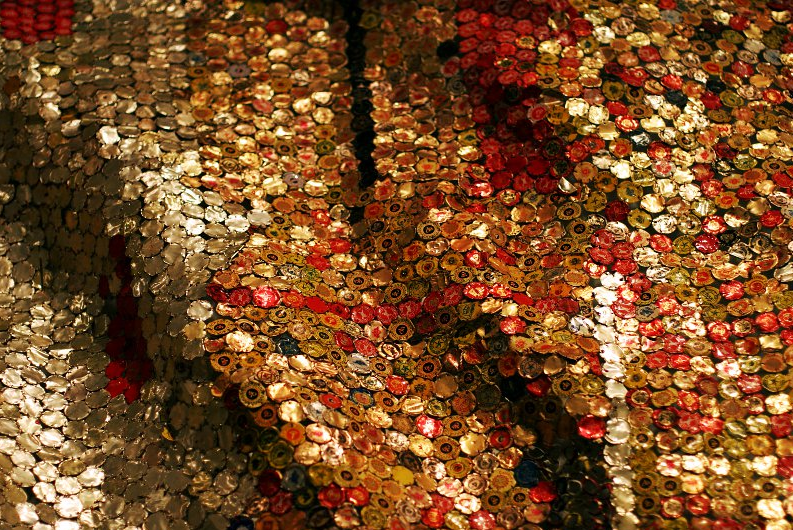 As you can see, Anatsui has used lots (and lots) of his material – in this case discarded aluminum caps from bottles of whiskey, vodka, rum, and gin. The use of these materials makes a distinct statement about the interconnection of alcohol to the transatlantic slave trade. The use of recycled materials from alcohol will also play a part in our new work; in our case, we are using discarded wine corks to make a connection to the North Carolina wine business. (And those wine corks will create a cork “beach” of sorts, connecting to the coastal community in the state.) In the greater scope, I feel alcohol can create and at the same time deteriorate communities, so our wine reference is still tying into the overall statement about community. And so now begins the invention of movement vocabulary to support our themes. 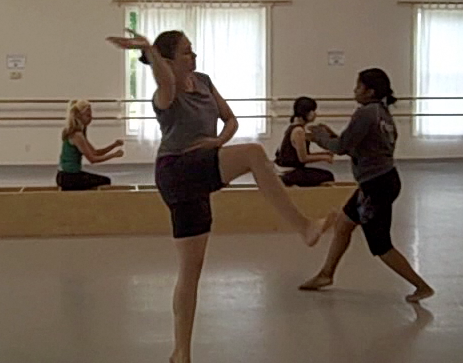 I am working on my own on movement prior to our next company rehearsal, where we will “test out” some phrase-work. We will be sure to take some video clips as we continue work; check back here to track our progress! To view more of El Anatsui’s work, visit the NC Museum of Art! Click here for more info on the current exhibition, When I Last Wrote to You About Africa.